It is always a joy to review the work of Alan Menken and the late and much lamented Howard Ashman. Not since the Sherman Brothers has a song-writing partnership nailed so perfectly that glorious combination of pathos, irony and hilarious self-deprecation that make for a good Disney soundtrack. 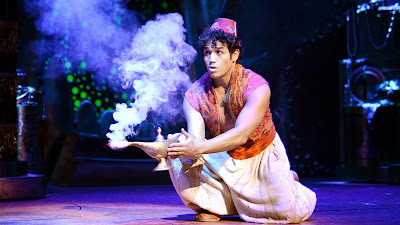 These two guys put the Genie into genius and so it is with Broadway's Aladdin, where their songs from the 1992 animated Oscar-winner form the backbone to the newly-expanded stage show. We all know of Robin Williams' gifted performance in voicing the cartoon Genie. Williams created a role nigh-on impossible to match, that is until Disney found James Monroe Iglehart. His blue pantalooned lamp-dweller is a breathtaking combination of comedy, dance and song with an audience rapport that is as confident as it is brazen. Iglehart has famously made the show, with his full-company act one blast of Friend Like Me proving to be an encore-demanding show stopper the likes of which don't come around often. Understudy Michael James Scott proved to be a top-notch cover on the night. Adam Jacob's Aladdin is a convincing take on the street rat with a heart of gold, whilst Courtney Reed's Princess Jasmine and understudy Merwin Foard's bad guy Jafar put in just enough to keep the story ticking over. Where the movie had talking animals as the comedy sidekicks (Aladdin's monkey, Abou and Jafar's parrot, Iago) the constraints of real-life theatre demand human henchmen. Abou evolves into three of Aladdin's buddies that include one food-fixated overweight shmuck, whilst Iago is also an obese (albeit wise-guy) buffoon of a foil to Jafar. Brian Gonzales and Don Darryl Rivera are both great comics in these roles, but whilst elsewhere Aladdin strives for political correctness with an almost patronising nod to Jasmine's pleas for sexual equality, it is disappointing that Disney still can't resist making the fat guys the laughing stock. The technical wizardry of the show is fun, although on this visit a loud auditorium alarm ruined A Whole New World. The show was halted whilst the fault was fixed, but then simply carried on where it had left off. Shame on you Disney. Many of the audience had paid a fortune to see THAT carpet fly (which it did magnificently) and to hear THAT song too (which was sadly reduced to sonic garbage). Ruin one effect and you ruin the other. The song and flying routine should have been repeated. Dollars wasted. The original movie ran for 90 minutes and with a stage show demanding another 60 to be filled, more songs are needed to pad. It is a genuine a joy to hear some Menken / Ashman work that had originally been cut from the movie, (notably the two numbers Proud Of Your Boy and High Adventure) but some of Bequelin's new stuff in the first half drags. Credit though, his act two newly-minted Somebody's Got Your Back, comprising knockabout swordplay, makes for an entertaining routine. Kids will love the show and it makes for a sure fire birthday or Christmas treat. Flawed, yes, but even so, Disney’s Aladdin is still a diamond in the rough.